The home improvement sector is outstripping the growth of the overall retail industry—and independent retailers are finding creative and ambitious strategies to fight off giant competitors. These successes were evident through the research and stories of independent home improvement retailers presented at the North American Retail Hardware Association (NRHA) 2018 State of Independents Conference. Growth was the theme of the event, which was held Dec. 6 in Chicago. 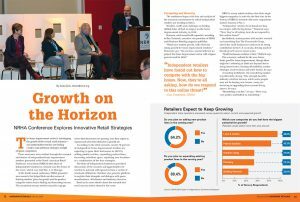 At the fourth annual State of Independents Conference, NRHA presented new research that helped flesh out discussions of thriving retailers’ plans for growth and the product categories where they’re finding and forecasting success. The association surveys retailers annually to gauge where their businesses are growing, how they expect to expand and what their obstacles to growth are. 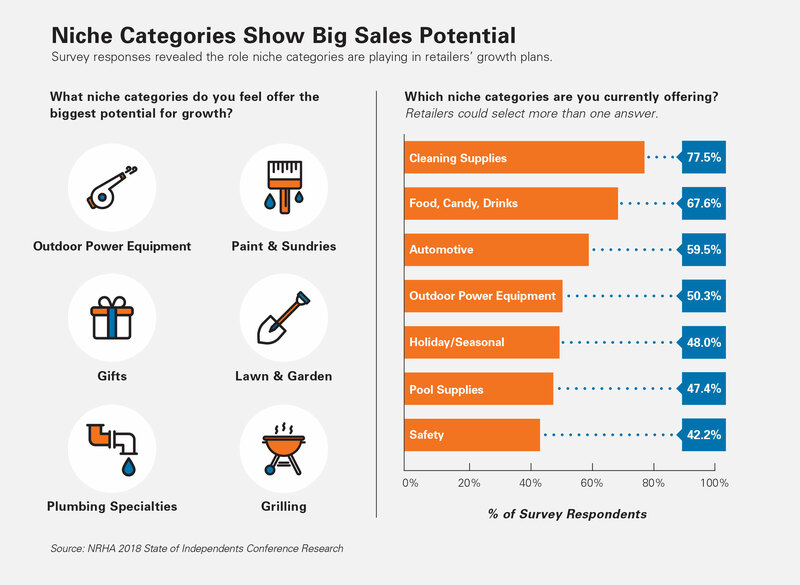 According to the 2018 research, nearly 70 percent of independent home improvement retailers are expecting to grow their businesses in 2019 by adding product niches, expanding product lines, increasing salesfloor space, exploring new locations or a combination of the four strategies. The State of Independents Conference provided discussions of the research and opportunities for retailers to network with operators from a variety of wholesale affiliations. Retailers also gained a platform to explain their triumphs and dialogue with peers, manufacturers, distributors and industry observers. Read on for more details about the research and retail success stories shared at the event. 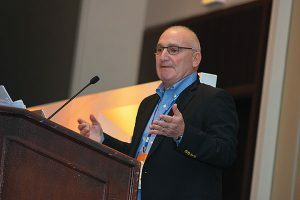 The State of Independents Conference began with data and analysis of the economic environment in which independent retailers are working to thrive. Weather, tariffs and challenges in finding skilled labor all had an impact on the home improvement industry in 2018. However, retail overall still expanded, according to Dan Tratensek, executive vice president of NRHA and Hardware Retailing magazine publisher. NRHA’s survey asked retailers what their single biggest competitor is and—for the first time in the history of NRHA’s research—the most respondents ranked Amazon at No. 1. Jim Robisch, senior partner with market research and consulting firm The Farnsworth Group, noted that small businesses continue to be strong contributors to the U.S. economy, driving much of the job growth seen in recent years. “Small businesses continue to hire,” Robisch says. The economic outlook for the near future looks good for home improvement, though there might be a softening in 2020 and beyond due to rising interest rates, housing affordability, worker shortages, trade tensions and other factors, he says. According to Robisch, the remodeling market is particularly strong. This strength benefits industry retailers because while some people may not be buying new homes, many are investing in upgrading their current living spaces, he says. Robisch predicted continued omnichannel growth for retail and an expanding need for independent retailers to improve the online experiences they offer to remain competitive. Big-box competitors, such as Home Depot and Menards, are gaining traction with customers by working to improve the product and project knowledge of their employees, Robisch says. As a result, independents cannot assume they’re beating the big boxes in areas, such as customer service, where they have traditionally stood out, Robisch says. The NRHA research also provided insight into the product categories retailers are growing and expecting more expansion from. New product lines, new products and niches are areas retailers list as the top three pathways to growth, Tratensek observed from the research. Independents have an advantage in that they are more easily adaptable than large corporations and can position themselves as innovators who can tailor their product mixes very specifically to their markets, Tratensek says. The top-performing categories in the past year for many independent home improvement retailers were lawn and garden, paint and paint sundries and plumbing, according to the data. 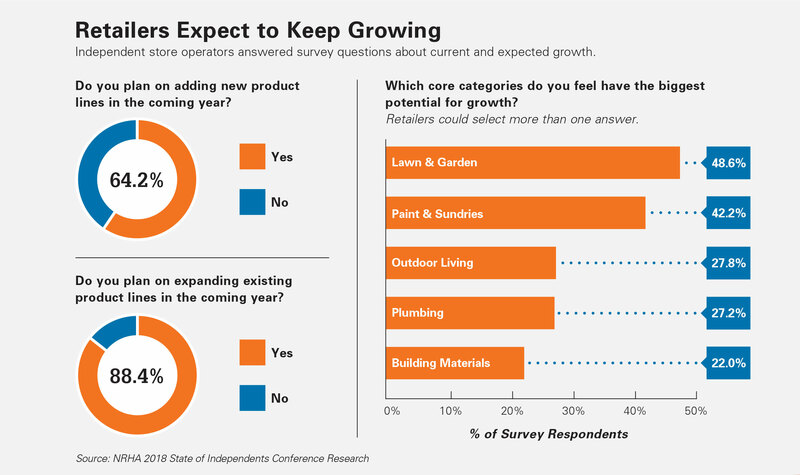 Research participants think lawn and garden and paint and paint sundries have the most potential for growth. The top way retailers identify where to add to their product selections is by listening to customers, according to the NRHA data. 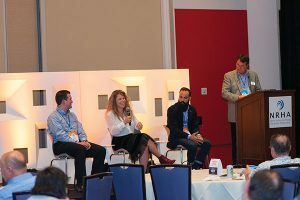 Retailer panelists at the State of Independents Conference discussed hot growth areas and affirmed the research, while also offering other ideas for staying on top of what customers want. For example, Matt Woods, owner of Woods Hardware in Cincinnati, has taken contractors out for coffee to get their input on new products and categories to grow. “They’ve been my best resources for trends and niches,” he says. From left, Matt Woods with Woods Hardware in Ohio, Jamie Gentner from Center Hardware in California and Joe Franquinha of Crest Hardware in New York discuss growth at NRHA’s 2018 State of Independents Conference. Joe Franquinha, owner of Crest True Value Hardware and Urban Garden Center in New York, also finds trade shows and industry publications helpful for staying abreast of new and growing trends. 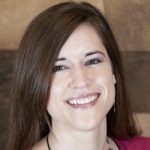 In addition to doing as Woods and Franquinha recommend, Jamie Gentner, chief operating officer for Center Hardware & Supply in San Francisco, looks to her knowledgeable staff and local artisans for insight into what her product mix should be. 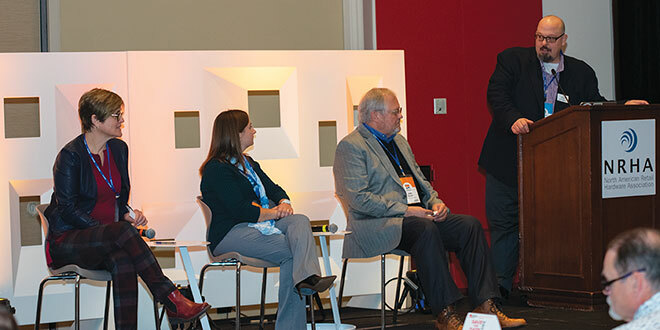 Three successful retailers took the stage during the State of Independents Conference to provide in-depth discussions of how they have grown their businesses through expansion projects. Their keynote presentations spotlighted three approaches to growth—adding a new destination department; adapting a large operation’s business model to work in small locations; and creating a high-end customer experience that can be replicated in many new and acquired stores. Franquinha saw potential for a lawn and garden department at his family’s store and found a multifaceted approach for expanding the business. In 2006, Crest Hardware had a 4-foot section for lawn and garden products, such as fertilizer. The next year, Franquinha added live plants and hardscaping materials. In 2009, he oversaw construction of a 5,000-square-foot garden center. Crest Hardware now has a 900-square-foot greenhouse that sells live plants year-round, in addition to the outdoor garden space. The garden department attracts customers who want houseplants, outdoor garden products, pottery and other products. Plus, the space is so beautiful, community members use it to host events, including weddings, parties, fundraisers and small concerts. Expanding the department has attracted new customers who are now loyal shoppers. “Test your ideas and take calculated risks,” Franquinha recommends. Hartville Hardware in Hartville, Ohio, is known for its 300,000-plus-square-foot store, but the company is growing by scaling down its business model to open smaller locations, starting with Hartville Hardware 2. Zach Coblentz, who is a division manager at Hartville Hardware, helps operate the main hardware store. 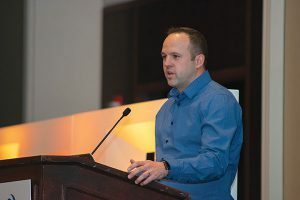 During his presentation, Coblentz talked about a path to sustainable growth, which, for him, has included growing as a leader within his company and planning for purposeful business expansion. Opening a second hardware store that is 10,000 square feet, provides new opportunities, according to Coblentz. Hartville Hardware 2 opened during the third quarter of 2018 and will allow the company to experiment with omnichannel options. “We see it as a research and development store,” Coblentz says. JC Licht, a Chicago paint and decorating company with 38 stores, is on an ambitious growth trajectory. The reason is a person: Elliot Greenberg. In 2015, Greenberg bought the business from paint manufacturer Benjamin Moore and set lofty goals to become the best in the market and grow at a double-digit pace. He hired an executive team, set out to create an energetic company culture that could be duplicated at every store, looked for opportunities to add store locations and diversified the business. Greenberg’s vision is to turn JC Licht into a paint-selling powerhouse with the best contractor customer experience in the Chicago area. The plan includes a focus on hiring and making the business’s success personal for employees and customers. For example, he has grown his outside sales team from nine to 19 people and sends them to visit every paint contractor in the market. JC Licht has also hosted events that draw up to 200 contractors at a time.